With this extreme reaction to the previous movie still fresh in my mind, I genuinely shocked me to see a seemingly overwhelming positivity surrounding the final movie in the sequel trilogy. It almost felt like people were ready to love Star Wars again. Sadly, with me being me, I have already forced myself to take a step back and glance upon this slice of history with a gleam of cynicism in my eye. Just to establish where I stand; I actually really enjoy the Last Jedi. It’s certainly a flawed movie, but every movie in the franchise has glaring flaws (except maybe Empire). I didn’t want The Last Jedi to be another movie pandering who a nostalgia thirsty audience. And it really wasn’t, the fact that it felt like it was willing to take big risks, shake up the status quo and really throw the fan base for a loop meant a lot to me. The fact that the movie defied so many expectations, laughed in the face of so many fan predictions made me love the movie for the very same reasons that made many turn against it. Which is why I am a little hesitant based on what little I’ve seen surrounding this new movie. The thing I’m worried about might all amount to nothing, maybe it’s just the little hipster inside me that wants to be subversive and bump up against the majority, but the thing that seemed to have the most people excited for the new movie is the very same thing that has me kind of bummed: The Emperor’s laugh. The visuals of the destroyed Death Star accompanied by the line “no one’s ever really gone” and then that laugh. It certainly makes for an exciting trailer moment, but it has me worried that Star Wars as a movie series can never truly remove itself from the shadow of the original trilogy. Something it really needs to do if it wants to grow in the way Disney obviously want it to. Kylo Ren continues to be my favourite new character introduced in the new trilogy. I hope his story gets a explosive conclusion. 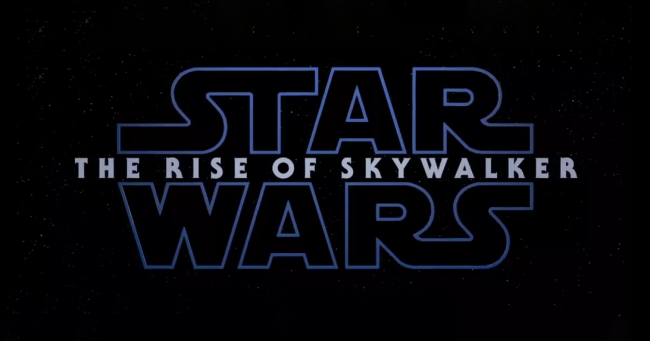 Even the title, as many different always as it can be interpreted, is almost like an act of resignation, chaining itself to the legacy of the Skywalker name, something I felt that the previous movie made a pointed effort to rebel against. Rey was a nobody, Snoke wasn’t important and Kylo Ren wasn’t the flawed hero waiting to be redeemed. It was all great. Now the implication is that Rey could be a Skywalker after all. Personally though, I don’t take this literally. During my huge, three part review of the Last Jedi when it came out, I made conjecture that the title; Last Jedi was literal, and referring to Luke. That Rey would be the first in a new breed of force user, different from the Jedi, whose legacy was always swinging between stagnation and near extinction. The title; Rise of Skywalker reinforces this theory. Which would be a major shift in the status quo, even from an expanded universe perspective. The Jedi would be no more and the force would be a different kind of presence in the galaxy, different from the order that had stood over over for millennia before. Which is exactly the kind of thing I wanted, whether its a story that Disney will continue after this movie remains to be seen. Speaking of which, the return of Palpatine isn’t a totally original concept. It’s something people had been expecting since The Force Awakens, it’s just surprising for it to drop this late in the game. Clones of the old Sith were a real ongoing problem in the early days of the old Expanded universe. Ihad really hoped this new trilogy would be a jumping off point for an entirely new version of the galaxy. Instead, it turns out that it was just part of the ongoing saga of the Skywalker’s and Palpatine that started all the way back in The Phantom Menace. In the end though, I am looking forward to the new Star Wars movie, as I do with everything Star Wars. I can be the guy who looks for the negatives in a good thing certainly, but when it comes to this franchise, I am a very easy mark, finding value in even the worst of their entries. Looks like we might be going there after all. And despite my concerns of Disney backpedalling on how much they want to be driven by nostalgia, I’m happy that the fans seem to be positive on the franchise again after a pretty grim couple of years. Coupling this with the reveal of the new Star Wars video game from Respawn, I am happy people are excited for Star Wars again. Star Wars is in a precarious place compared to when Disney first acquired it, I hope that this movie succeeds and re-sparks their ambition for the franchise. Posted on April 15, 2019 April 15, 2019 by WooderonPosted in Movies, My Thoughts on:Tagged episode ix, finn, lando calrissian, luke skywalker, palpatine, poe dameron, rey, Star Wars, the rise of skywalker, trailer.